What do gamers listen to and how can I serve them? To the tune of 10M concurrent viewers, American producer/DJ Marshmello played a live DJ set on Feb 2 2019 to Fortnite players in Pleasant Park, a virtual location in the massive multiplayer game that took 2018 by storm. Gamers tuned in, showed up with their customized avatars, and danced on the virtual floor and on the DJ stage with Marshmello. Accumulating $3B+ in revenue last year alone, Epic Games’ latest venture into live music seemed natural, as the in-game dance “emotes” have long been a meme-able signature feature in what’s mostly a first-person shooter gaming experience. If this all looks bizarre to you, you’re probably not much of a gamer (or you don’t have kids yet). But it’s worth taking a look at the gaming community, and how music plays a part in their lives, because 10M concurrent viewers does not necessarily equal 10M streams on Spotify or Apple Music. Compared to a passively hearing a stream off of a playlist, a concurrent viewer in a gaming/live-stream environment means they’ve made time to be present in a visual, aural and tactile (through the controller) experience. In an attention-driven economy, music can once again hold center stage in a new context. Sure, there were more people watching the Super Bowl LIII Halftime Show (98.2M viewers on traditional TV)…but did they get to dance on-stage with Maroon 5? In 2014, twitch.tv (already at 55M subscribers) cost Amazon a cool $970 million for what was then a notable move into the live-streaming space. It was not the $1.2B used to buy Zappo’s in 2009, nor the staggering $13.7B later used to get Whole Foods in 2017, but for a world mostly unseen in popular culture, it was a huge mark of validation from Amazon, one of the “Big Four” tech companies (besides Apple, Facebook and Google) looking to dominate every aspect of our lives. In the short five years since, Twitch has solidified its keystone status in a rapidly growing video game community, of which e-sports and live-streaming are close cousins. Boasting an average of 15M daily active users (DAUs) with the average user spending 1.5+ hours on the platform, it has 3.4M+ creators live-streaming monthly, and saw 560B minutes of content consumed in 2018. Given all the statistics, it’s easy to forget what radio DJs and programmers know all too well: that’s a lot of time to fill. Funny streamer quips and in-game sound effects aside, there’s a huge opportunity for more sonic content to accompany the game’s visuals and overall, keep viewers entertained. Epic-drop dubstep with loads of distorted saw-waves? Maybe. Lo-fi SoundCloud rap? Possibly. Soft classical? You never know. While we do not have access to millions of gamer listening preferences, what we can do is look at the community’s musical taste-makers and analyze their playlists. Swedish streaming company Spotify features 44 curated playlists on its Gaming Hub, located in the “Genres & Moods” Browse tab. For random users who are in a curious mood, or for gamers looking specifically for some tunes that speak to them, a significant amount of discovery can happen here. Sitting along other context-based (not genre-based) hubs like “Dinner” and “Romance”, the Gaming Hub represents recognition from one of the world’s top music streaming companies. Spotify has always been forward in recognizing groups long ignored in most Western/Anglo-oriented media environments, embodied in its Desi, Afro and Arab Hubs, for example. 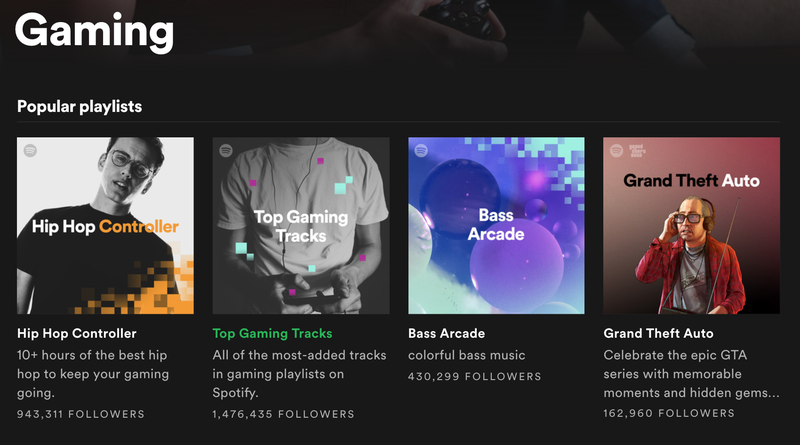 At 1.48M+ followers, Spotify’s top gaming playlist is “Top Gaming Tracks” and sits at the 139th most followed spot on the platform. It’s just behind “Classic Road Trip Songs” (car playlists do quite well) at 1.482M+ followers and edges out Justin Bieber’s “This Is” playlist at 1.47M+ followers. Billed as “the most-added tracks in gaming playlists on Spotify”, Top Gaming Tracks seems to be a superset of all of their other curated gaming content, which could potentially end up being a playlist form of circular reporting: if Spotify believes gamers listen to only hip-hop and electronic music, then of course its “best” list will mostly yield hip-hop and electronic music since that’s what it was mostly working from in the first place. To play devil’s advocate, The Verge’s Megan Farokhmanesh opined in Nov 2017 that some of Spotify’s curated gaming content struck her as quite stereotypical and outdated. 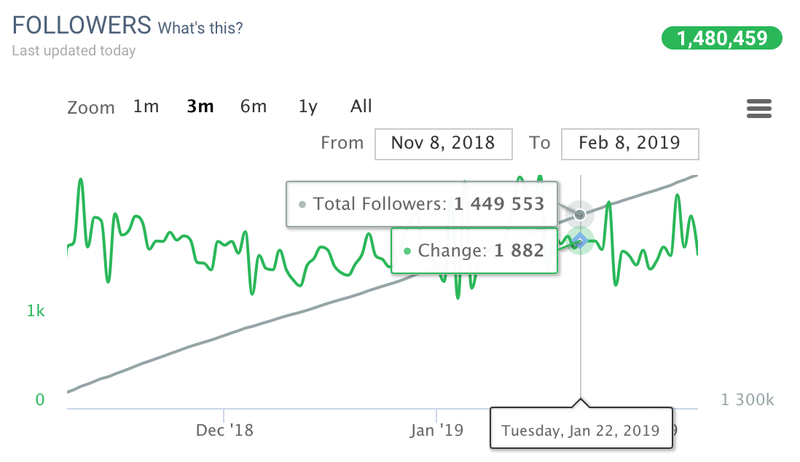 Nevertheless, with a rough average of 1.8K followers added per day over the past three months, Top Gaming Tracks is on track to break 2M followers within a year. More than 3/4 of the playlist’s artists hail from the US, with the roster definitely skewing towards a Western perspective (e.g., UK, Australia, Norway) and likely an English language preference. From a genre perspective, more than half of the current tracks are tagged as hip-hop/rap, which would conform to a generalized expectation that the gaming community skews towards those two genres plus electronic music. This is also demonstrated with over 86% of Spotify’s #2 gaming playlist (“Power Gaming” at 1.1M follows) also being tagged as hip-hop/rap, and the Spotify’s #3 gaming playlist (“Hip Hop Controller” at 946K follows) being….well, very hip-hop. From a more musical perspective, we can also use Echo Nest’s audio featuresto get a better feel for the tastes represented here. “Energy” here represents a “perceptual measure of intensity and powerful activity” in the track, and we can see that Top Gaming Tracks likes to keep things peppy, which is also echoed in “BPM”, or beats per minute. A tempo of about 90–100 BPM is mostly considered to be middle of the ground for Western music, so it would make sense that most of the playlist skews towards the speedier half of the scale. “Valence” is a much more subjective beast that analyzes “musical positiveness”, or what could be thought as simply positive or negative emotion. The higher the score, the more positive/happy. Valence in this case is much more evenly distributed, which coincides with a trend towards “sadder” popular music that we first noticed in back in Nov 2017 when profiling Today’s Top Hits and RapCaviar. Since the 1990s, New York City-based Rockstar Games and San Francisco Bay Area-based EA Sports have steadily earned a reputation among gamers as two companies who do music right, with the former’s Grand Theft Auto (GTA) and the latter’s FIFA & Need for Speed (NFS) franchises. This is a testament to both music supervision departments, though each franchise is wildly different: the first being a trigger-happy romp through criminal underworlds, the second being the go-to soccer video game for fans wanting to feel like Messi or Ronaldo and the third being a car aficionado’s dream speeding around city blocks with police hot in pursuit. But what they all have in common is a years-long music strategy that is deliberate, truly integrated into each franchise’s brand, and such a standout feature that fans have come to look forward to the music that will be included in the next game’s installment. For example, EA Sports’ Spotify profile has faithfully been curating their official game soundtracks since 2016. Taking a look at the latest installment of FIFA 19, we can already start to see its massively different playlist profile. Though half of the tracks’ artists still are Anglo-oriented (from the UK/US), FIFA’s international culture begins to come out with artists from Italy (rapper Ghali), Korea (DJ Peggy Gou), Mexico (producer/remixer Toy Selectah) and Colombia (singer Lao Ra). Even more striking is the sheer diversity of genre: though electronic and hip-hop are still the #1 and #2 most frequent tags in the playlist, they are only ~15% and ~10% respectively. Cumbia, afrobeat, grime, reggae, and folk music all make an appearance in EA Sports’ latest installment. While FIFA 19’s soundtrack keeps the Top Gaming Track’s precedent of higher Energy & higher BPM music, it shows a more well-distributed Valence chart. Not necessarily making you too happy or too sad, it’s almost as if FIFA’s music supervisors are curating a range of emotions to help you through the wins and losses of your virtual soccer season. It’s also possible that such an international soundtrack is defying Echo Nest’s Valence algorithms somewhat, but that would require a much deeper dive into music theory and data science. Last but not least is one of the gaming community’s leading maverick music labels, NCS. Formerly known as NoCopyrightSounds, NCS’ initial mission in 2011 was to provide live-streaming gamers a royalty-free yet awesome-sounding soundtrack to their hours-long streams that avoided copyright bots like YouTube’s Content ID. Wielding over 20.5M YouTube subscribers and 5.6B YouTube views, the YouTube-first label features a “freemium” model that allows gamers to monetize their streams with NCS music for free (with appropriate attribution), with the expectation that it would provide revenue generation down the line in the form of paid downloads and streams on paid platforms. Two of its brightest successes were surpassing 1M paid downloads in Dec 2017, and also making Norwegian DJ/producer Alan Walker’s “Faded” go viral, now sitting at 2.2B+ YouTube views and launching his career. NCS’ biggest Spotify playlist is “NCS Releases” at 608K followers, providing nearly 3.5 hours of free music for gamers to stream with. Streamers can simply pull up this playlist, press play, and game on with no worries of copyright infringement, as NCS does not enforce digital rights protection online. As if FIFA 19’s soundtrack weren’t diverse enough, NCS Releases’ artists and genres are glowing example of how unique the gaming world’s music tastes can be. The genres clearly show no majority, though NCS is still an electronic music-focused label. Echo Nest tags have simply been able to categorize each track with more detail. With over 60% of the artist country’s listed as “Unknown” on Chartmetric, in this case it usually means that the artists are so new that there is no biographical information for us to document for them. This would fall in line with NCS’ brand of taking bedroom producers and giving them a global audience they couldn’t get nearly as fast on their own. For the artists we do have countries for, they are 100% European, which makes sense given that NCS is headquartered in London and likely is well-networked in the region. For acoustic characteristics, NCS Releases again falls in line with the higher Energy and higher BPM theme for gaming music, but sets itself apart in the more “negative” Valence scores its tracks earned. With over half of the 61 tracks falling below 60, NCS’ premiere Spotify playlist seems to emote a much darker tone. Los Angeles-based Riot Games, the game development company behind the massive multiplayer online battle arena game League of Legends (or LoL; grossed $1.4B in 2018 revenue), went the extra mile last year for what was essentially a new set of in-game character skins. For the 2018 LoL World Championships in Incheon, South Korea, Riot Games actually formed a virtual pop group called K/DA (gaming lingo for “Kills, Deaths, Assists”, a popular player metric for in-game performance), voiced by actual artists. Two members of K-pop group (G)I-DLE (2.3M Spotify monthly listeners) and two American singers performed live along with their avatars in augmented reality. It’s reminiscent of NCS’ freemium model for music purposed for live-streaming: while the K/DA production itself likely didn’t make money, it must be driving new users toward the game for later monetization and at the very least, is getting people involved into gaming culture in general which is good for the industry. All in all, gamers’ music tastes seem to be a diverse group that- if we are to lend credence to the some of the community’s taste makers- tends towards faster, high energy music, but can also run the gamut of emotions and sentiment. If marketed to properly, the music business can make in-roads to authentically connect with the gaming community and serve them without friction. Whether it’s through enabling the free use of music, curating the perfect sonic backdrop to a game, creating a virtual pop group or having an in-game concert, it’s a great time for the music business to innovate in these areas. When done right, it could result in Marshmello’s recent 10M concurrent viewers delivering revenue later downstream: listening to his work on repeat via a subscribed streaming platform, becoming concert ticket buyers in real life, or perhaps making an in-game skin purchase relating to him. Or if you’re K/DA? Having as many as 90M concurrent viewers later becoming paying fans after watching their Opening Ceremony performance. Maybe the next Super Bowl should feature avatars.